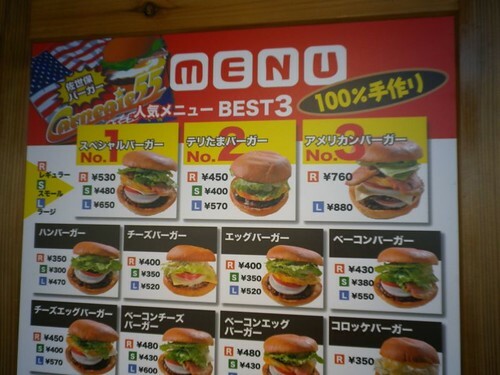 The second option would be to head to the countless clones and satellites inspired by the original Sasebo burger . This is exactly what I did after a long day at work. I drove to the city on a quest for a burger. The popular chain Carnegie 55 has just opened a new restaurant in the Kannabe area of Fukuyama city. The restaurant is located on the busy route 486 just a couple of minutes away from Fuji Grand shopping center. 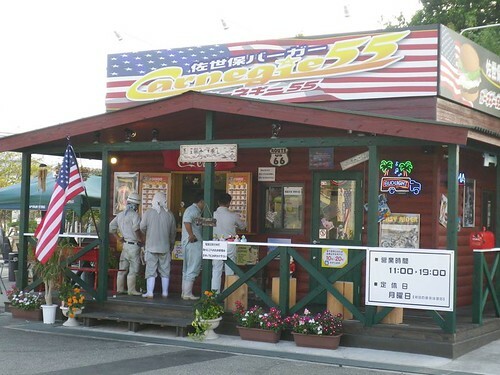 It is impossible to mistake this hamburger shop for a fine izakaya since the owner of Carnegie 55 decided to play the foreign card 150% with a big American flag emblazoning their corporate logo. The shop is basically a pick up window in the middle of a parking lot. The place reminded me of the hot dog shack of my youth in the suburb of Montreal. It’s the epitome of the North American suburb food experience transplanted in the suburb of Fukuyama. I ordered a large #3 with a side of potato wedges and a drink. 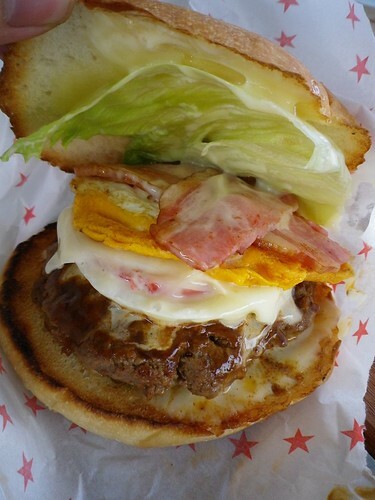 The #3 features 2 paddies of beef, onion, tomato, a fried egg, cheese, 2 thick slices of bacon, salad and the Sasebo burger magic sauce. The whole thing cost 1180 yen. I sat on the covered terrace adjacent to the burger shack to wait for my meal. 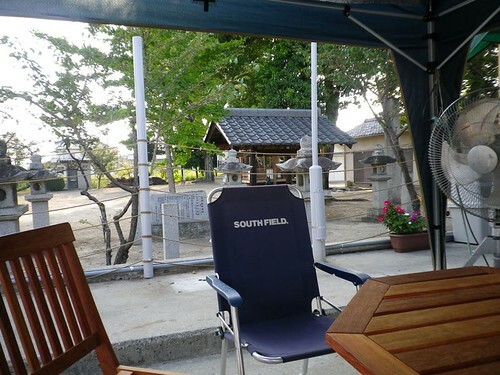 The view is actually stunning since the burger shop is located right next to a small shinto shrine. 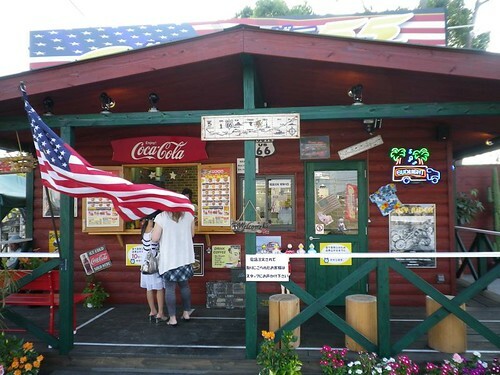 The contrast between the loud American flags and vintage signs and the shrine is striking. The burger was delivered to my table in a paper bag about 10 min after ordering it. The burger itself does satisfy a craving. 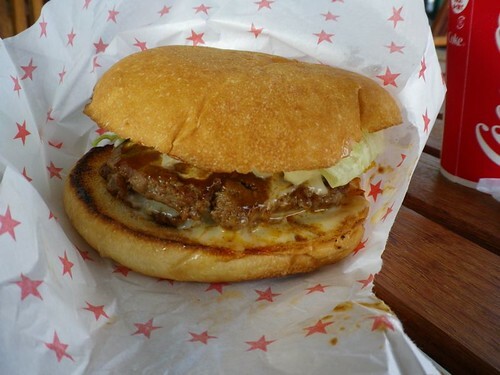 It’s better than a McDonald burger and slightly better than the tiny burgers at Mos Burger. 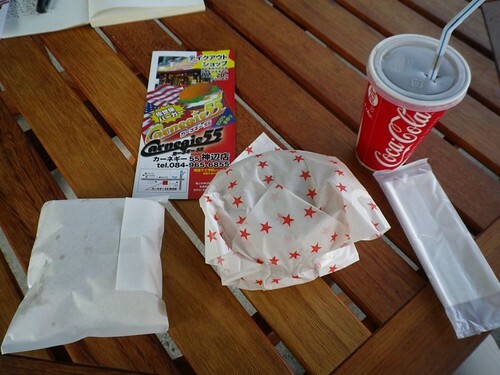 Eating a Sasebo burger is always a messy business and I had a very difficult time eating this one without dropping sauce all over the place. I am still looking for the perfect burger in the land of the rising sun, but for the time being, I will go back to my exploration of Japanese food.